This summer has been a hectic one, as you might have gathered by my lack of posting recently. Of course the beauty of a hectic summer, hopefully, means enjoying everything that is summer- the delight of spending time with friends, the laziness of evenings spent outside, and savoring every bite of summer produce. Strawberries, fresh, local, sweet strawberries are one of those delicious items that demand to be enjoyed as long as their season allows. Now, each week I buy strawberries and use them mainly in my breakfast- and then by the end of the week I end up with some unhappy strawberries - not quite "bad" but not as stellar as they once were. So I've been seeking out ways to use up those little berries before all is lost. Combine the last six ingredients in a blender, food processor or a container that will accommodate an immersion blender, and puree. 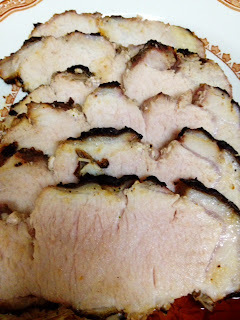 Place the pork in a Ziploc bag, pour this mix over the pork, seal the bag and place in the refrigerator for up to 24 hours, rotating the meat every so often. Pre heat your grill, and then grill the mean, starting with the fat side up for approximately 20 minutes a side- depending on its thickness. Once fully cooked remove from the grill and let rest for 10 - 15 minutes. 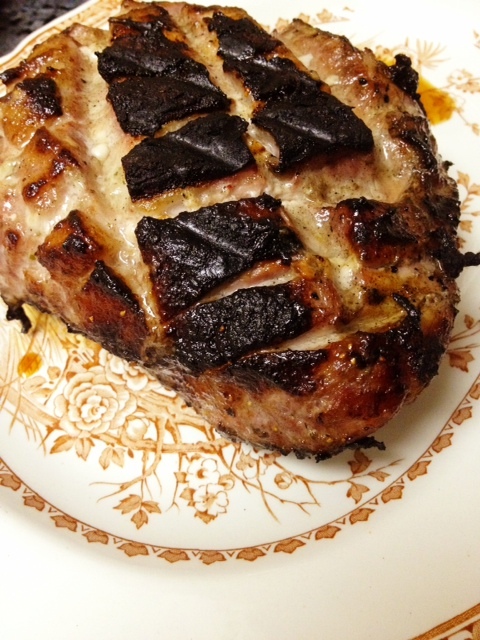 I took a bit of a shot in the dark with this recipe- hoping that the flavor of strawberry would sink into the pork. I was not mistaken- the strawberry was a delicious presence- though not overwhelming. It's subtle flavor combined with the heat of the chili flakes and a touch of garlic was a delicious change from a typical pork marinade and was a wonderful way to celebrate the berries of the season. What a fantastic use for what I think is one of best parts of summer!